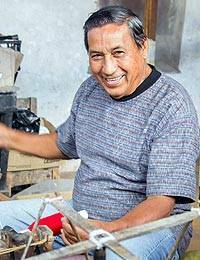 Guatemalan artisan Eladio Chiroy uses a traditional foot pedal loom to weave local cotton into vibrant table linens. Aqua, emerald, cobalt blue and deep lilac blend to create mesmerizing stripes evoking the colors of the sea. Featuring six napkins in a solid cobalt blue and six striped placemats, these table linens make a wonderful addition to any home.